Launch of Blog ‘aheadwithstyle’ February 2015 Goodbye Hair, Hello Me! My name is Eimear Coghlan, I’m Irish (from Mallow, Co.Cork), and I was 31 and living in London when I was diagnosed on 4th December 2014 with Stage 3B Grade 3 invasive Breast Cancer which had already spread to my lymph nodes. My doctors told me it was curable if I started treatment straight away so 12 days after my diagnosis I had my first session of chemotherapy. I turned 32 in March 2015 during my 5th cycle of chemo and I finished all my 6 cycles of chemo on 1st April 2015. I had my 7hr operation on 20th April 2015 which was a double mastectomy, removal of my lymph nodes and LD flap reconstruction all in the same op. I finished my 5 weeks of radiotherapy on 22nd July 2015. While undergoing my cancer treatment, I continued to work as I was able to do so but I was subjected to very unfair and cruel treatment and discrimination by my former employer who didn’t want me there. I brought them to the Employment Tribunal and I won my Discrimination and Harassment case. My husband and I moved to his hometown, Mazzarino, Sicily in July 2016 where we set up and currently run a successful private English language school: Morgan School. After launching our business and just a year and half after finishing chemo, I fell pregnant and gave birth to a beautiful baby boy, Salvatore, on 14 July 2017 – just shy of 2 years after finishing all my cancer treatment. Cancer was not the end of my life but the beginning of it. 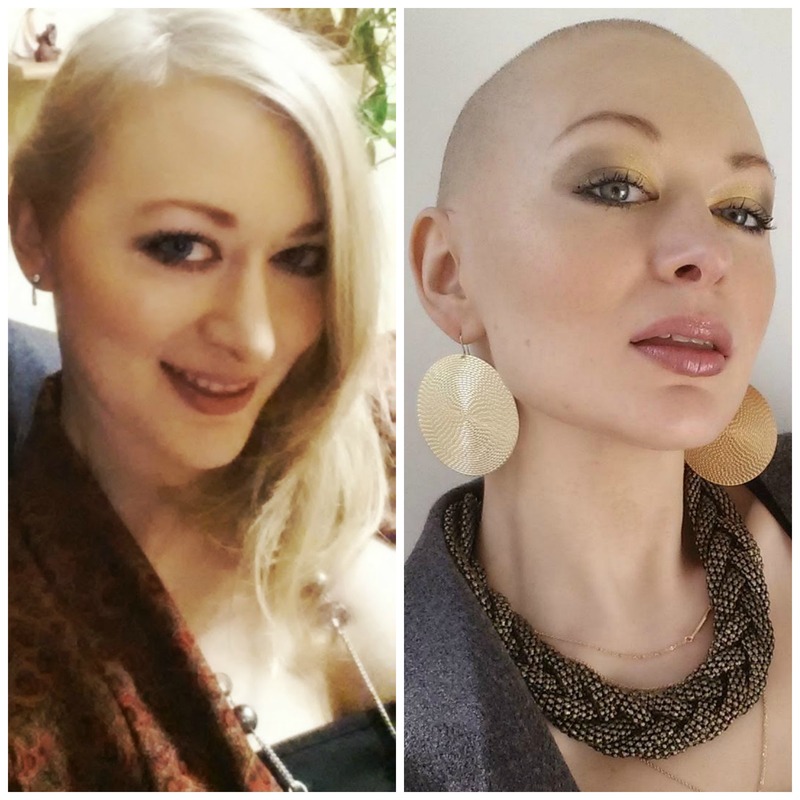 Two weeks after my first chemo treatment, my hair started to fall out. I tried to see it as a cleanse, a metamorphosis; wiping away the cobwebs of the old to make way for the new me. I got my hair cut up pixie short the day after my second chemo session hoping it would slow down the hair loss to no avail. Since my hair had thinned so much on top I bought a wig and wore it for two days but I knew that I would have to shave all my hair off. I looked to the internet for inspiration to comfort me on my journey into the unknown and though I found blogs and pictures of people recording their hair growth and their strive back to normality, I couldn’t find anyone proudly embracing and rocking their bald look. Once my head was shaved I looked in the mirror and smiled, there wasn’t any fear that could hold me back anymore. I felt powerful. I felt free. I decided then and there to not bother with the wig anymore but to set the bald head free. I started playing around with earrings, jewellery and makeup as I wanted to celebrate my head and immediately I felt very proud of my new shaved look. It greatly inspired me to be more adventurous and daring with my style. It unleashed the 15 year old me who used to have so much fun with clothes and each day became a “Love Your Head” day. I started sending my siblings photos of my edgy new look and I realised if it was comforting to my siblings that it could comfort other Chemo Queens by making the big shave less daunting. On 13th February 2015 I launched this blog as I wanted to help others who are going through the same thing and who are looking for encouraging photos to comfort their leap into the unknown. I decided to be the inspiration I wished I had and I wanted to help other women the way I wished I was helped. I hope I can inspire those going through cancer that you can celebrate your head and be ahead of cancer with style. I realised there is a certain power to be gained when you look strong and stylish on the outside. The strong inside you needs to be reflected on the outside, if it isn’t then it can pull you down like an anchor. It’s not superficial, it’s a necessity. Style and accessories help keep both inside and outside you in sync. Own your look, rock your look, love your look. Then you’re ready to face anything. Thanks to my deep and unshakable Christian faith in God, finding out I had cancer has been an inspiring spiritual journey. The tough physical effects of the treatments made me knock on the door of my deepest thoughts and explore the confines of my soul. This is the path I must take and part of my God’s plan for me. I have never questioned God. He’s the Captain of my Ship, and I have never felt safer. When I found out that I had breast cancer, my best friend Kirby Rubens and I were having a lovely deep conversation about faith and God in a bistro pub when I got up to go to the bathroom. As I made my way upstairs, I couldn’t help but smile as I pondered on our words when a scouting agent approached me and said he would like to put me through for a Burger King advert. He told me that I was the happiest person he had seen all day and that he had been looking around London all day. I couldn’t believe it, I have never been scouted for anything before in my life! The Burger King advert was filmed a week before my first chemo session but it came out on the television the first week of January 2015, just as I was starting my second chemo session. Now as I look at the advert, all I see is my long limp dull blonde hair and I realise that I had been going through a hair-life crisis long before all this happened! Perhaps I wasn’t destined to have long hair after all! This photo is of me on the morning of my wedding day, looking out to the cathedral where we were getting married in Cefalu’, Sicily in 2012. It’s very symbolic to me. I found out I had breast cancer just two years in to our marriage. You never stop to think that the vows “for better, for worse, in sickness and in health” can come much earlier than anticipated but when it does, it really shows you the strength of your marriage. You both look out towards life together and tackle any challenge together. This picture also shows how everyone is behind me as I go on this journey. I don’t look back but I face it head on; looking out towards my faith has made this possible. Goodbye hair, Hello me! For a glimpse of who I was before I embarked on this journey, this is a video my lovely sister Aileen made about me for my Hen Party in 2012. I’ve just started to follow your blog which I find so inspiring and encouraging; for it’s almost two month now since my husband’s diagnosed with cancer; it’s now 13 1/2 years since we’ve got married, and I truly believe that the key lies in looking ahead, going through this journey TOGETHER, as you say “You both look out towards life together and tackle any challenge together”. I think that’s what’s giving me strength. Please excuse my rudimental Englisch as I’m not a native speaker. Eimear, you are beautiful, stylish and talented. Congrats on the Freshly Pressed. I enjoyed it very much! Keep fighting, stay creative, be you! Eimear,you are an inspiration to everyone.well done on your positivity and great faith!you might be interested in the website credence.org.phillip is a researcher of all diseases incl.cancer.i wish you all the best! I always knew this great girl would make an impact on others. Well done Eimear. You were great on the BOC show. Eimear you are such a wonderful & inspirational person. Just saw you on Brendan O’C show. Keep up the positivity & please God your treatment goes well & you will be back to full health. The biggest statement ever is ‘health is wealth’ & no lotto payment will ever replace it. Just watched you on the Saturday Night Show ..
has helped you spread to all the others who will come into contact with you and aboard your ship of Life …..
Stay safe and very Blessed always ….. I have just been watching you on the Saturday Night Show and you are an inspiration to all in your situation. You look amazing and, please God, you will regain full health asap. I will be praying for you. Keep up the good work! You are kind hearted warm person, bubbly and full of life. Being so positive with the deck of cards you have been dealt with and making the best of it with what you can. It was a lovely experience to watch you on The Saturday night show with Brendan O’Connor, you are a Pro on TV. Congratulations on your wedding and your husband and family are there to support you in every way. Stay positive and continue to be an inspiration to others. Eimear you are an inspiration! Your beauty both inside and out shines like a bright light! Eimear, having had the privilege of being one of your bridesmaid at your wedding I can honestly say I thought I could never witness you looking more stunning that you did that day. However, your cheekbones and beautiful head have me thinking – really ??? Maybe all that lovely hair was not for you…. you look STUNNING. I am bursting with pride.